An LED wall lamp can provide any room in your home with soft sophisticated lighting. 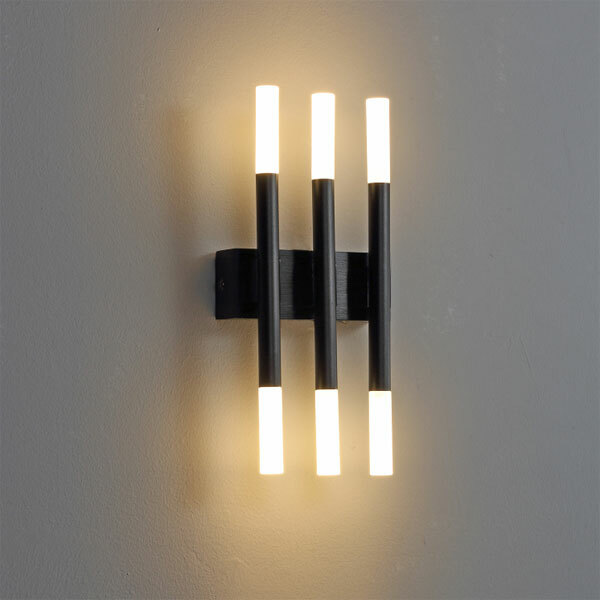 Interior wall lights cast a soft glow on around the parameters of the room and is often used to highlight artwork or other room features you want to show off. It also can provide romantic lighting for in your dining or bedroom. Interior wall lights come in a variety of shapes and sizes and can be used for a variety of different functions such as the lighting for entire rooms that don’t need brighter lighting, they can be used in closets and in walk-in pantries as well as to light staircases or hallways in both homes or hotels. Here at Ultra Beam Lighting we have a wide variety of different indoor wall lights suitable to meet your needs. Our LED wall lighting comes in numerous ultra modern designs and are unique since we design our all of our interior wall lights ourselves you will find each and every one of our LED wall lamps are unique and won’t be found in any other lighting stores. Our indoor wall lights run from 1 watt to 20 watts depending on the lamp you choose. Here is a look at the benefits of choosing a LED wall lamp from our company. High Quality Wall Lighting in Unique Designs– We use high quality materials in each and every unique LED wall lamp. These indoor wall lights are of the highest quality and standout among interior wall lights from other lighting companies. Saves Energy- LED lights save on energy usage since most of the energy actually goes to the lighting of the bulb, standard light bulbs spend 80% of their energy in wasted heat, with only 20% going toward actually producing light. Long Bulb Life- LED light bulbs have an incredibly long life lasting for around 20,000 hours and lasting 20 times longer than traditional light bulbs. Three Year Guarantee- Our LED wall lamps come with a 3 year guarantee, which is longer than most other companies offer for their wall lighting or any other type of lamps. We Employ the Latest LED Technology in Our LED Wall Lamp- We use the latest LED technology in our LED wall lamps and all of our other lighting as well. Do keep in mind when you have any type of wall lighting installed in your home you to hire the services of a fully qualified electrician to install the light for you. Installing a light yourself or hiring someone who is unqualified can result in injury to your and a possible fire risk to your home. Why not explore all of the different types of LED interior wall lights we have available. Take the time to browse through our website to find the right LED wall lamp that meets your needs and your home décor. Should you have any questions or want to order one of our LED wall lamps give us a call at 0800-678-5156.